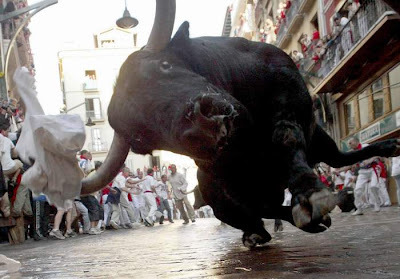 Bull running is a highly dangerous 'sport', where participants regularly end up on the end of a horn. As with any sport involving bulls, one has to wonder whether it is brave to take part, or just plain dumb. Anyway, here is a picture of 'Rush hour', Pamplona style. One can presently book a vacation to a Bull Run, and if this is how you see yourself having fun, do it soon, because the EU bureaucrats are trying to outlaw it.